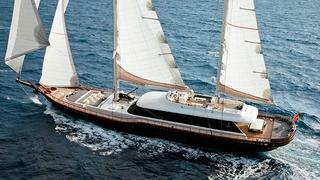 News just in from the Monaco office of Yachtzoo of a €1.45 million price drop on the 46m sailing yacht Infinity. Built in cold-moulded mahogany by Turkey’s Cobra Yachting in 2011 to RINA class, Infinity accommodates 12 guests in a master suite, VIP stateroom and two double and two twin cabins. MCA compliant, she has twin 650hp Volvo engines giving a cruising speed of 11 knots and features a large sundeck with spa pool, lounging areas and a bar. Infinity is down from €8.95 million to €7.5 million.